The consultation documentation comprises the consultation document and some questions, the draft guidance document itself, a draft environmental technical annex to the guidance, and a separate document about a new category of airspace change (known as 'Tier 2') which the Government is proposing to introduce. Download the draft guidance document (CAP 1520). Download Annex 1 - the draft environmental technical annex (CAP 1521). Download Annex 2 - a document about 'Tier 2' airspace changes (CAP 1522). Download the consultation document and questions (CAP 1523) as a single pdf. The purpose of this consultation is for the CAA to learn your views on new guidance that we have drafted to support our new airspace change decision-making process. 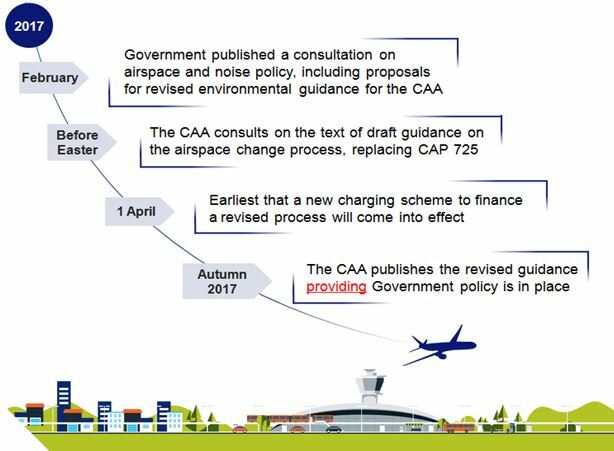 In March 2016 the CAA consulted on the principles of a new process that we were proposing. In October 2016 we published our report on that consultation and set out the new process we are now introducing (CAP 1465, available online). 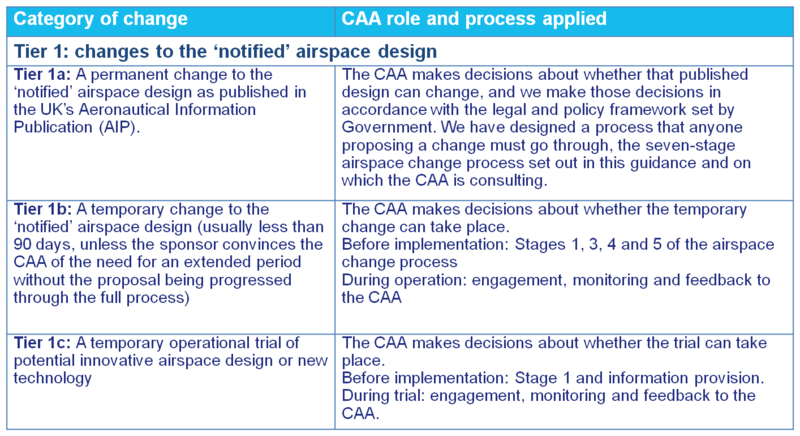 The guidance that we have drafted defines what will happen in the new process, including each stage a sponsor of an airspace change must complete; the stakeholders they must engage at each stage and our expectations of that engagement; and how the CAA assesses the proposed change. We are inviting your views as to whether the guidance is appropriate – including your views on whether our description of the stages of the process are comprehensible, transparent and proportionate. Airspace is the volume of space above ground level and extends as far as aircraft can fly. Airspace has to be managed so that it is used safely and efficiently. In the UK, airspace is either considered to be ‘controlled’ or ‘uncontrolled’. In controlled airspace, there is a system of structured routes and aircraft are managed by air traffic control services. The design of controlled airspace is set out in the UK’s Aeronautical Information Publication (AIP). The CAA makes decisions about whether that published design can change, and we make those decisions in accordance with the legal and policy framework set by Government. We have designed a process that anyone proposing (or ‘sponsoring’) a change must go through, to ensure that we get all the evidence we need to make our decision. The process includes public engagement as part of the design process, as well as options appraisals to produce comparable evidence about the design options. 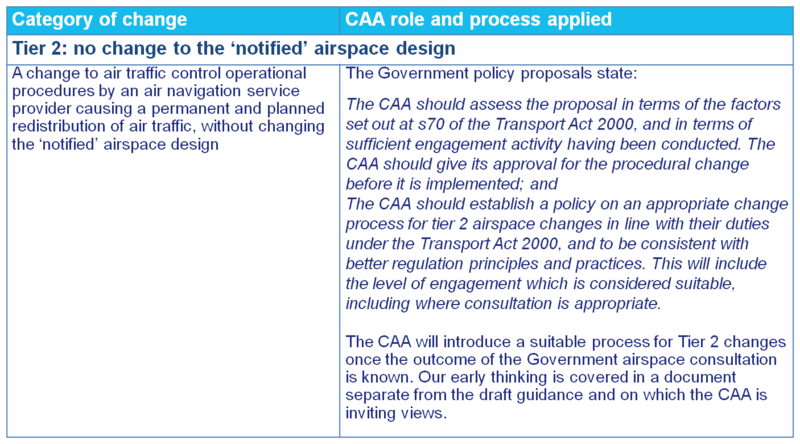 In addition to the CAA’s decision-making role on the published design of airspace (in the AIP), the Government is currently consulting on policy proposals that would give the CAA a role on other types of changes to airspace. (Reforming policy on the design and use of UK airspace, available at https://www.gov.uk/government/consultations/reforming-policy-on-the-design-and-use-of-uk-airspace). 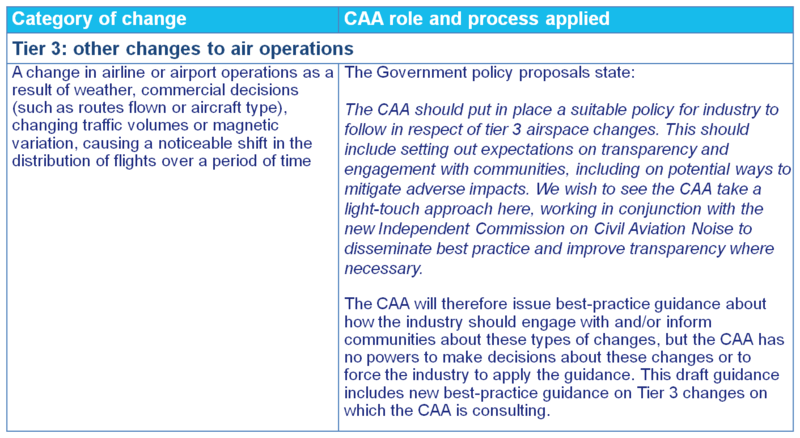 The Government’s policy consultation proposes a three-tiered structure for categorising changes to the design of airspace or the way airspace is used. This is summarised in the table below, which sets out those Tiers and the types of changes they refer to, which will be covered in the CAA’s guidance. The draft guidance on which we are consulting is divided into categories of airspace change – Tiers 1, 2 and 3, with three elements to Tier 1 (1a, 1b and 1c). The main part of the draft guidance concerns Tier 1a, the seven-stage airspace change process used for permanent changes to the published airspace design. The document guides you through each stage and describes what will happen at each stage of it, and why. There are other ways that the airspace design or the way it is used can change, and the impacts of such changes can also vary greatly. Therefore this guidance also has shorter sections on the processes that apply to the other tier categories. These are Tiers 1b and 1c covering temporary changes and trials respectively, and Tier 3 covering changes other than to the formal airspace design. The guidance will, eventually, cover Tier 2 changes also. At present, we are not in a position to set a new process for Tier 2 changes. Instead, we are asking for early views on how we should consider meeting the Government’s proposal. The appendices to the draft guidance go into more detail about how those involved undertake or engage in various tasks associated with these processes. The appendices cover activities such as how to consult and engage with stakeholders, how to develop design principles, and how the CAA will undertake a post-implementation review. This list is not exhaustive; please see the draft guidance for the full list. Please answer the consultation questions by following the link below. We are asking for comments before 30 June 2017. We cannot commit to taking into account comments received after this date. The questions include some multiple-choice answers and the opportunity to submit your comments by completing text boxes. Please note that if you prefer not to give a multiple-choice answer, the questionnaire will still allow you to complete the text box. We understand that some stakeholders may prefer not to be constrained by the questions alone. We have therefore also included a text box for general observations not covered by the questions. While we will not refuse a self-contained, separate response sent by email, we will not be able to analyse such responses in the same way that we analyse the online responses. Our strong preference is therefore that you complete the online version. If you would like to discuss anything about how to respond, please email airspace.policy@caa.co.uk or telephone Trevor Metson on 020 7453 6230. Please note that any submissions not submitted through the online consultation website will be published in their entirety unless you also submit a redacted version with any material that you do not want us to publish, whether this be your identity and/or personal details, or actual content. Before we publish responses we will moderate them to remove unacceptable material such as defamatory or offensive remarks. We have based our moderation policy on Government guidelines. It can be found under Related Documents below. Please think carefully before making statements about a specific organisation or person. We will be obliged to redact any statements from the published version if they do not meet these guidelines on unacceptable material, and this would deny others the chance to see your views. This consultation is not a referendum: we will need to take account of all views and balance different and often competing interests. This means that we will not automatically implement every idea or solution that gets the highest proportion of support, particularly if that support comes from only one of the many stakeholder groups we need to take into account. the link at the foot of this page under 'Related Documents' for offline responses not received through this website. We published the revised guidance document on 13 December 2017.